The Donald Trump loyalist who famously said he'd take a bullet for the President is now willing to publicly fight his former boss. 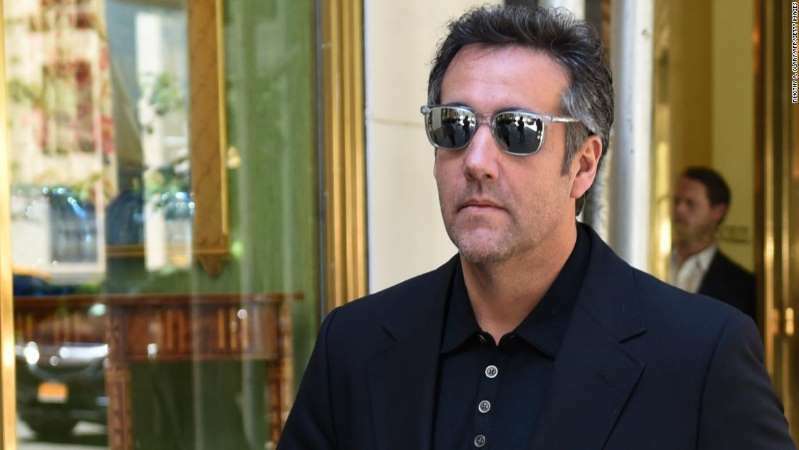 Michael Cohen, the President's former lawyer, is prepared to campaign against Trump and Republicans in the midterm elections and the 2020 presidential race, a Democrat with knowledge told CNN. Marking the latest escalation in Cohen's growing animosity towards Trump, the source said he is open to doing a range of things to try to help the Democratic Party, including stumping for candidates, giving speeches and helping raise money. A political campaign against Trump would mark a new capstone in the already extraordinary public split between the two men. The rift has been on display for months, as Cohen has made it increasingly clear that he no longer had loyalties to his ex-boss. Last month, ABC News reported that Cohen had sat for multiple interviews with investigators from special counsel Robert Mueller's office as well. What is less clear is how realistic it is for Cohen to get involved in national politics. Cohen has not had any meaningful conversations at this point in time with Democratic leaders about the possibility hitting the campaign trail or donor circuit for the party, the Democrat with knowledge added. And some Democrats could scoff at the idea of enlisting Cohen who, until recently, was an outspoken supporter of Trump before pleading guilty in August to eight criminal counts and is awaiting sentencing in December. A spokesperson for the Democratic National Committee declined to comment. There are only three weeks left until the midterm elections and Cohen is expected to get some jail time soon after. His ability to hit the campaign trail is also physically constrained: US District Judge William Pauley has limited Cohen's travels to parts of New York City, Washington, Florida and Illinois as he awaits his sentencing. Asked about his past vows to "do anything" to protect Trump, Cohen told ABC News in July: "To be crystal clear, my wife, my daughter and my son, and this country have my first loyalty." The alleged party registration change from Republican to Democrat last week would not have been Cohen's first time switching party loyalties -- he was a registered Democrat for many years leading up to the 2016 election and became a Republican after being asked to serve as deputy chairman of the Republican National Committee's finance committee. Cohen resigned from that post in June. Cohen has largely been laying low since the FBI's massive raid of his home, hotel room and office in April. He tweeted on Sunday that the upcoming midterm elections "might be the most important vote in our lifetime" and encouraged people to vote. Cohen's lawyer Lanny Davis, who worked for President Bill Clinton in the 1990s, said on Twitter that his client's return to the Democratic Party was a part of "distancing himself from the values of the current (administration)." Trump, too, has made clear that he has soured on his ex-attorney. "If anyone is looking for a good lawyer, I would strongly suggest that you don't retain the services of Michael Cohen!" he wrote on Twitter over the summer. Cohen's friends have previously told CNN that since publicly turning his back on Trump, the 52-year-old has received both public support and pleas to take on Trump from strangers who recognize who he is. Investigators in New York probed Cohen's various business dealings as well as work that he did in his capacity as Trump's self-described "fixer." Cohen was involved in payments made to certain individuals, including adult film star Stormy Daniels, to keep them quiet about their alleged affairs with Trump. Despite initially saying that he had acted on his own when he arranged for a $130,000 payment to Daniels as part of a hush agreement, Cohen had changed his tune by August, when he said in a Manhattan courtroom that he had arranged hush money schemes "at the direction" of Trump.